The Earth 4 Energy e-book by Michael Harvey actually has 2 sections. 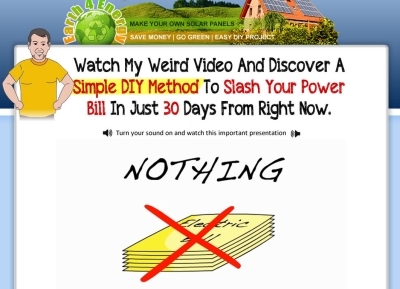 One section consist of Do It Yourself (DIY) home solar power system while the other section covers a residential wind generator. In this post, I am going to review the wind generator section of Earth4Energy. The residential wind energy guide is actually in PDF file format. It starts off by explaining how we can harness the energy of wind to produce electricity which can be used to supplement our home energy needs. In general, the wind power system consists of 5 parts which are the generator, blades, mounting, tower and control panel. The process works by using the blade to capture the wind potential energy to spin the generator which will produce Direct Current (DC). The current is then stored in a battery bank. A power inverter will be used to change the Direct Current to Alternative Current (AC). The AC can then be used to power most of the electrical appliances at home. From the looks of it, making the wind generator is easier compared to making a home solar power system. Reason being, there are less wiring and soldering works. A typical solar panel will require at least 70 soldering points. Your solar system may need from 3 – 5 solar panels. You can do the math there. The hardest part in the construction process is making the blades of the wind generator. No doubt Earth4Energy provides a set of blueprint, but it does require some precision skill. It is best you have an electric saw and sanding machine. Should you attempt to make the DIY wind generator yourself? That depends on your personal skill set actually. If you can make a DIY solar panel, making a wind generator to work together with the system should not be much of a challenge for you. Then again, if you can’t read a wiring diagram and if you are not good with hand tools, it is best you outsource the whole project and save yourself a bunch of headache. For more information about Michael Harvey’s manual, check out the Earth4Energy review on this blog.